A car emergency is something you want to avoid. When you need help, you shouldn’t have to wait for hours. Your car is important for many different reasons, and without one, there’s not too much you can get done. Getting around without a car is difficult, and although there may be public transportation or other technology, such as Uber and Lyft, you may not feel like riding with a stranger every day or catching the bus on a daily basis, especially if you are grocery shopping. A car emergency shouldn’t be the highlight of your day or night. If you have a vehicle emergency, give us a call. We’re here to help. 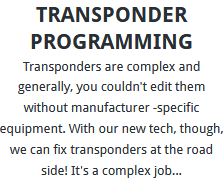 Why do you need transponder programming? Transponder programming is technology that attempts to keep people from stealing your car. Without a valid microchip, your vehicle will not start. Vehicle theft is on the rise, and car manufacturers are making good use of enhanced technology to prevent as much car theft as possible. New model cars have transponder programming for additional security. A car thief may figure out a way to get to your car, but stealing it will be another challenge. Having a transponder program in your vehicle means you can’t have anyone other than a professional fix your car. A person who doesn’t have knowledge of transponder programs can damage your car permanently, and cause your vehicle to malfunction. Transponders need to be installed correctly, as well as authenticated. Keys break for a variety of reasons. 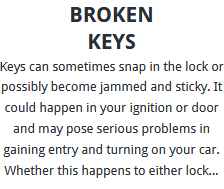 Sometimes keys are broken off in the door of a vehicle or in the ignition. Broken keys can be fixed, but you don’t want it on your to-do list too often. We fix broken keys all the time, and ready to help you. Broken keys can be a complicated job, but it’s nothing we can’t handle. The staff here at Auto Locksmith Northampton is experienced and specializes in repairing broken keys without damaging your car. If you lose your keys, don’t feel bad. We make replacement keys every day. There’s no need to panic. 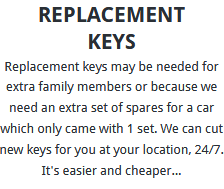 We can make new keys for your car without requiring your old keys. Losing your keys can turn a great day into a terrible day. Visit us, and we will get everything fixed for you. You have to get to work and go to other important places and events, and can’t be without your car. Renting a car is too expensive. You shouldn’t have to break the bank to replace a lost or broken key or get transponder programming service. At Auto Locksmith Northampton, we have awesome prices, deals, and specials that will not empty your wallet. We are always here to help whenever you need us. Call or visit us today! We can help! When? How? Why me? These are the rhetorical questions I am sure that cross your mind when you lose your car keys. Worry no more. We at Auto Locksmith Northampton are there to fix it. Why Auto Locksmith Northampton is a sure bet? 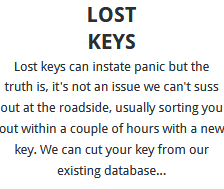 We can replace that broken key, lost key or do transponder programming in a flash. You may be familiar with other service providers who promise to be there always for you and only to find out that at that very moment of need they are nowhere to be reached. We have got you covered 24 hours in a day. Literally, whatever time of the day you call, be sure that your call will be answered that very moment. You don’t have to call twice for us to respond to your call. Some service providers will take time to pick your call and after that drag their feet to reach where you are. BUT do they understand the fix you are in? Sure we understand each letter of the word emergency. Therefore we avail our services instantly without any delay. We pride in our top of the bar team of experts. They are always at stand by to respond to any desperate call from our most esteemed clients. We at Car Locksmith Northampton do affirmatively mean that we are capable of doing that replacement of a broken key, lost key or do that transponder programming at your convenience. Our experts are not only knowledgeable about our work; we are experienced and passionate in every bit of a task at hand. You may be wondering how we are able to do that replacement for a broken key, lost key or do that transponder programming since most cars this days have immobilizers that help to stop someone from breaking the locking barrel and starting the car. Here at Auto Locksmith Northampton, we have a complex programming tool that helps us to make a new key for your vehicle. We do install another micro chip in the key and enter into your car computer, program the key to work with the computer in the car hence starting and driving the car as before. In case your key is lost or broken, we will unlock the door then code the lock so as to be able to cut a new key for the car. Will they really sort me beside the road? You may be having such a question in your mind. Yes we can, Auto Locksmith Northampton don’t have any place preference. As long as you are in Northampton and its surrounding areas, we are there for you. Be it beside the road, at a public parking, your court at home we can come there and do what we always do best. We don’t have place preference; neither do we have car model preference. We are experienced in servicing all cars. Be it a Range Rover, Audi, BMW, Volvo, Mercedes Benz, Volkswagen, KIA literally any car model you can name. Car model has never been our limit. So when stack at Northampton, reach the best Auto locksmiths in Northampton. We Auto Locksmith Northampton are the best 24 hours emergency auto locksmith in town. All our clients are smiling don’t wait longer join the party and be sure you will smile too because of our top of the bar services.